Search results: "Quick Smoke: Punch"
When I reviewed this Punch in March 2015, my biggest complaint was “a sharpness that scratched at the back of my throat for much of the cigar.” After more than a year and half in my humidor, that’s gone and the Signature Robusto (5 x 52) has come into its own. A strong, spicy smoke with a slow burn, it was enjoyable from beginning to end. If you’re willing to invest the time—or can pick up Signatures that have been sitting awhile on your B&M’s shelves—I believe you’ll be rewarded. I’ll admit that while I’ve always enjoyed the Punch Rare Corojo line, I haven’t smoked many in recent years. But when my colleague recently reviewed the Rare Salomones size, I thought I should revisit the line. Salomones are one of the most impressive-looking sizes, and this is no exception with its reddish wrapper and double bands. Once you get past the initial couple minutes, the large format produces plenty of smoke. It features leather, earth, and fruit notes and is medium- to full-bodied. It’s an elegant smoke worth paying attention to for a full 90 minutes. The Punch Gran Puro Rancho (5.5 x 54) is a Honduran puro. The wrapper and binder leaves are sun-grown and the cigar is constructed well. It burns medium- to full-bodied in strength with core flavors of cinnamon, pepper spice, and an earthy sweetness. While not extraordinary, it is a fine selection for the golf course. Sometimes size does matter. For me, this smaller Punch Rare Corojo is the best of the bunch. While I’ve enjoyed several of the four larger PRCs, this 4 and 1/2 inch by 50 ring gauge box-pressed beauty was smoother and more complex. The dark, oily Ecuadorian Sumatra wrapper had little prelight aroma. But with the Connecticut broadleaf binder and a three-country filler blend, tastes vary throughout the stick, generating cocoa, chocolate, occasional spice, and leather. 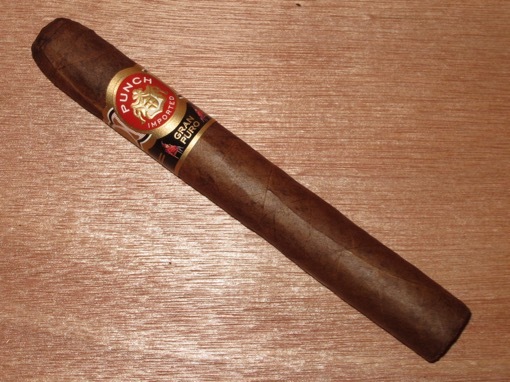 Smoking slowly – a necessity to avoid overheating – this cigar can easily last an hour. I paid $4.50 for the stick. Boxes of 50 can be had for about $125 on the Internet, and just before I wrote this, I saw that the PRC is on special through Aug. 17 at Famous. The Punch Prensada Maduro No. 4 is a six and 1/2 inch by 43 ring gauge box-pressed “toro” that sits heavy in your hand. With a full-bodied chocolate flavor, it lacks the spice characteristic of most Punch cigars, but it’s still balanced and tasty. The cigar produced abundant smoke from an easy draw, and I can easily recommend it.